In a world where first-party data has become a fundamental component to reach both existing and potential new customers, sophisticated digital advertisers integrate this data into digital media strategies to market their mobile apps. Advertisers have seen the tremendous power, growth, and progression inherent in using first-party customer data to drive down costs and acquire new customers in their direct response marketing initiatives. 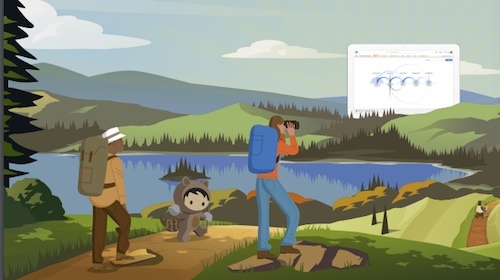 Salesforce Marketing Cloud customers can integrate this first-party data into their mobile digital media strategies in several powerful ways by targeting ads based on their customer data and segmenting it based on anything from in-app activity to purchase behavior. Advertisers then have the ability to automate the creation of dynamic Custom and Lookalike Audiences that allow advertisers to create highly-targeted ad campaigns to generate real business value from in-app purchases. One Salesforce Marketing Cloud customer in the mobile app space uses Active Audiences to create dynamic Custom Audiences built from newly acquired and existing mobile app users that refresh every day. Using these dynamic Facebook Custom Audiences built from existing app users, the advertiser then creates Lookalike Audiences for each country that they operate in before launching highly-targeted mobile app campaigns aimed at acquiring new customers (who look like their existing customers) in these key locations. Before launch, the advertiser also ensures that the Custom Audiences are excluded from the Lookalike Audience targeting to avoid wasting ad dollars on existing users. Since these Custom Audiences automatically refresh each day, the lookalikes are also automatically updated, enabling the advertiser to reach more potential customers every single day. This allows for an always-on marketing strategy for the advertiser since new, highly-relevant users are being continuously added to their audience targeting. Through creating this stream of dynamic and automated events with Active Audiences, the advertiser has not only eliminated data security concerns and hours of manual work involved in creating new audiences, they have also eliminated the need to continuously swap out existing audiences with newly updated ones. Another advertiser in the financial services industry has found that customers who use their mobile app have a better experience with their brand, and are more likely to become brand loyal compared to users who do not use their mobile app. 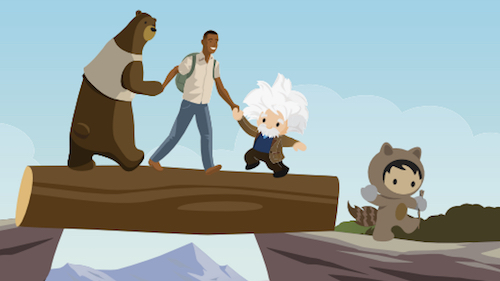 To improve customer relationships with non-app users, this advertiser uses Salesforce to create two types of audiences: One of all their existing customers and a second of their existing app users. The advertiser then creates highly-targeted mobile app install ad campaigns aimed at converting non-app customers into app users by excluding the dynamic app user custom audience from the audience containing current customers. Once an existing customer installs the app, they are moved to the app user custom audience and will no longer be targeted with mobile app install ads. This advertiser found that this strategy not only increased their app user conversion rate significantly with existing customers, but new customers quickly convert into app users since they are being dynamically placed into custom audiences as soon as they sign up for an account. In mobile gaming, high-value users are critically important to the success of games. 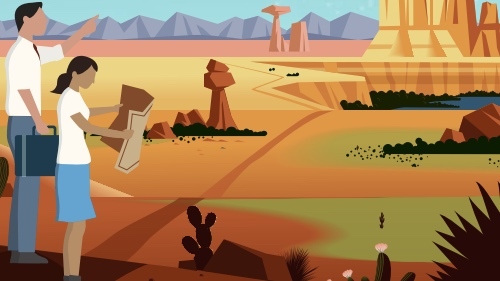 One Salesforce gaming customer discovered that by using Salesforce to segment audiences based on in-app activity such as in-app purchases and lapsed player timeframes, they were able to bring lapsed high-value users back into their app to resume in-app monetization. The advertising would pair enticing retention advertisements with each individual audience and analyze the lift in high-value users per audience. By using Salesforce to create audiences based off of in-app monetization, this advertiser saw a 30% increase in the amount of lapsed high-value users coming back into the app. 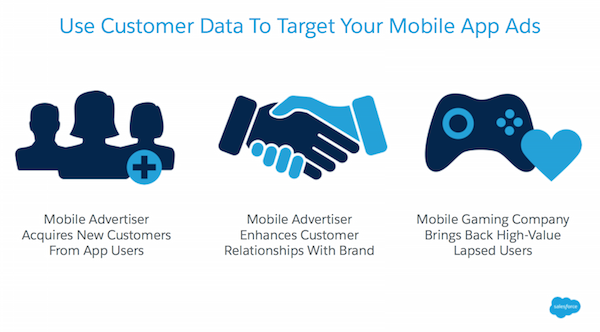 These are only three of many different mobile advertising strategies from our clients that use Facebook custom and lookalike audiences automatically created and updated within the Salesforce Marketing Cloud to generate real business value. If these digital media targeting strategies sound like they can help grow your business, show this article to your manager to begin talking about leveraging Marketing Cloud Advertising to grow your business. To learn more about how you can harness the power of Active Audiences, check out our whitepaper.